A few days back I wrote an article titled Shouldn’t the UN & World give priority to the Victims of LTTE killings first” to which the following comment has been circulated to me & a host of others. In case there are others peddling the notion that both sides must take equal blame, I would like to pose some questions for which I hope the proponents of this theory can answer validating their logic for putting a national army & a terrorist organization on par & treating them both equally and present the rationale in not highlighting all of the crimes the LTTE has committed which are in far excess than that which are being attributed to the army, on the premise that it is ‘blind loyalty’. Who is this ‘knowledgeable’ audience? Can we ignore LTTE carnage since 1980s upon innocent villages initially & then entering towns & cities to carry out bombs & suicide missions. Shouldn’t our empathy go to these dead victims & their families? Are we not lucky not to be in their place? Then what about the living injured how many of these are still suffering? Many of them cannot even earn their own living because of LTTE. This past cannot be swept aside by anybody. Only the victim’s families & the living victims know what they suffered from LTTE. How can we ask them to forget over 300 murderous attacks by LTTE – virtually every day, every month, every year for 3 decades? When LTTE were involved in these murderous acts, were the soldiers doing the same to us, the citizens? Therefore, can we put this part of the past aside because it does not belong to the ‘both sides to blame theory”? Who are we to tell the victims, to let bygones be bygones simple because we want to strike a deal of compromise. As for the fair outcome for the people involved” after May 2009, the lives of innocent civilians are now saved from LTTE bombs & suicide missions, poor & low caste Tamil children are saved from being kidnapped & turned into child soldiers & the soldiers too are not at risk of getting blown to pieces from landmines & other LTTE bombs. It is only those who benefitted by LTTE Inc who are angry & upset & wish to seek revenge. Is this ‘knowledgeable’ audience also aware & able to link the LTTE demands being connected to the original self-determination started in Tamil Nadu, borrowed by Sri Lankan Tamil leaders as they needed a slogan to hold the Tamil people together & hijacked by the LTTE to legitimize their armed struggle which initially had the backing of the Tamil political leaders. Has it not occurred to this ‘knowledgeable’ audience that this entire homeland & separatist propaganda is simply a cover to masquerade their illegal international network that brings in millions to their kitty from human smuggling, illegal drug smuggling, credit card scams, money laundering etc. The issue has also a ruse for geopolitical agendas of West & India. If none of these factors are taken to consideration in any discussion or negotiation, no wonder they think us fools & easily gullible. It is agreed that the LTTE when it took up the armed struggle were like the JVP hyped up youth that could easily be brainwashed by an ideology fed into their system. Many of these young cadres would have been put on drugs given that LTTE were versatile drug/narcotic smugglers. We are also aware that many of these young children kidnapped from poor & low caste Tamil homes were traumatized in many ways through gruesome training to kill & hate Sinhalese whom they had not even met or seen. Our hearts do melt when hearing these individual stories related by the 594 child soldiers who were given a presidential pardon & turned into ordinary children by the previous government – the story of Gokulan the cadre turned singer is one that will melt any heart. But, the fact remains many of these cadres were willing killers while others were forced to kill. These willing killers were among the surrendered LTTE cadres who refused to be rehabilitated some of whom the TNA are now asking to be released claiming them to be political prisoners. Are the ‘knowledgeable’ audience aware of this? We cannot sympathize with willing killers. Then we have the members of the armed forces the bulk of whom come from rural, poor Sinhala Buddhist homes. Every home, every workplace, everywhere you find a black sheep & there is no denying that some soldiers would not have functioned to the military code of conduct but the military has enough of records of removing such soldiers that have been found guilty and there is a system that the military follows in removing such soldiers/officers. However, the tactics adopted by a national army in defense of the country cannot be compared to the tactics carried out by an illegitimate terrorist group. The tactics the armed forces carry out should remain confidential & no one can demand these to be shared with any party (the disclosure of this we know led to the Millennium City debacle & the killing of 44 armed forces personnel). In the case of the LTTE – anyone going against the LTTE leader was simply shot dead, any child not willing to undergo training & crying to return home also got shot dead. We all know what happened to Mahaththaya who turned out to be a spy for India. So where do we place this in the ‘both sides to blame’ theory? When anyone accuses that I am highlighting only the fault of the other party”, can this person show me cases where the armed forces have entered Tamil villages cut up pregnant mothers, sleeping babies & men farming? Can these accusers show me examples of our armed forces entering mosques & murdering Muslims in prayer? Can these accusers show me examples where our armed forces have entered Buddhist temples or Kovils & shot dead people meditating & praying? Can these accusers show me examples of our armed forces carrying out suicide attacks & bombs on passenger buses, trains & in public places? Can these accusers show me how many children our soldiers have kidnapped & turned into child soldiers? So whoever comes up with this ‘highlighting only the fault of the other party’ needs to be more sensible than making barren statements which they cannot substantiate with facts. In claiming that I am highlighting only the fault of the other party the next allegation is that my loyalty often seems quite blind & insensitive” – are we to be loyal to an internationally banned terrorist movement? Are we clap at all of the murders committed by the LTTE over the decades and credit these murders to ‘oh they were simply going against the bad policies of the State & armed forces”, how can we be so heartless to these innocent victims, majority are from rural & poor homes and these victims are not just Sinhalese, Muslims but foreigners & Tamils too? Where are we blind or insensitive? Armed groups also roaming the North some even attacking members of the armed forces. Those that want to present the scenario of taking the supposed middle path & simply claiming both sides committed wrongs must next explain what should happen thereafter. What are they proposing beyond the acceptance that both sides committed crimes? Have they forgotten that even the legally questionable Ban Ki Moon’s 3 member panel report also faulted both sides but the War Crimes Tribunal is only against the Armed Forces that too without evidence of having killed 40,000 people – 9 years on we still do not have 40,000 dead names, there are no skeletons even! While on the subject of treating both parties equally – can we have examples of LTTE saving close to 300,000 as the Sri Lanka Armed Forces did in May 2009? Win for whoever is mightier” – every game has a winner & a loser. Both world wars ended up victor’s justice. We continue to seek accountability for over 500 years of colonial crimes perpetrated by the very countries that are self-appointed world’s policemen but continuing to commit every crime they accuse others of. Can anyone show where UN or these Western nations have been unbiased & impartial? Where has the West’s war on terror landed – every nation the West wants to conquer & take over their resources has some terrorist trouble! It is those peddling these new notions that are now even asking not to honor the fallen heroes with a minutes silence probably because LTTE cadres are not included in the honor! And the West is still going after the Nazi’s – men who are in their 90s are still being arrested! We are living in times when the self-appointed custodians of peace & human rights are bombing countries, illegally invading & occupying them & even manufacturing conflicts & creating terrorists to justify their presence & enabling the sale of arms & ammunition to both the State army & the terrorists they have trained. We have a UN that has silently approved these supposedly ‘humanitarian R2P interventions” & even nodding their heads to sanctions knowing the victims are the common public. Anyone seeing the suffering of the people in Yemen will demand to close down the UN, the international NGOs & charities that are supposed to save people – can this ‘both sides must take blame’ be applicable to Yemen too? In an internal conflict as in Sri Lanka the rules of war apply to both sides & if such is the case we do not see the application of IHL & their violations by LTTE being used to demand criminal action against LTTE. Let us also not forget & hope the ‘knowledgeable’ audience has also not forgotten that there would have been no requirement to call for a military defeat of the LTTE had India not threatened Sri Lanka not to capture a cornered Prabakaran in 1987 & instead whisked him off to India in an Indian helicopter, thousands of people would have been alive if the foreign governments aware of LTTE offices in their countries stopped these fronts from operating & materially supporting the LTTE over the years, thousands of property would not have been damaged if foreign governments did not knowingly sell their sophisticated equipment & communication and post-LTTE defeat when the UNSC Resolution 1373 was incorporated to ban 15 LTTE fronts operating from US, Canada, Norway, UK, Australia & other EU countries & India, if these governments had taken the interest to at least investigate these fronts operating from their countries there would not be any need to say LTTE international networks are alive but expect Sri Lanka to remove the Prevention of Terrorism Act & other terrorist counter measures that deal with likely terror scenarios repeating in Sri Lanka. LTTE did not give us peace – LTTE gave us blood & tears. However, 27,000 soldiers sacrificed their lives to give us peace and an equal number lie injured some unable to even move a limb & they are not even 30 years old & they will continue to suffer like this for life. We cannot forget these sacrifices. Moreover the co-sponsorship of the UNHRC resolution lays blame on the Sri Lankan Armed Forces & the demands for a new constitution, a war crimes tribunal by en bloc Western nations in the UN with their satellite states clearly reveal a bias. The both sides to blame theory can be applicable only to the last stages of the conflict in the application of IHL rules of war. However, the international terrorist experts tasked to look into the various allegations that had been made have clearly established that the Sri Lankan Armed Forces have not committed war crimes. The comment ends by claiming Sri Lankans should become more mature in their attitude & approach” – the simple answer to this is so long as there is no level playing field, we see no reason why there should be crocodile tears for a terrorist movement with restorative justice for LTTE & retributive justice for the national army. 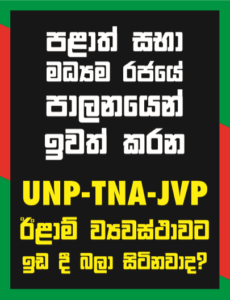 In such a scenario, we must defend the under dogs which in this case is the National Army while the power of money has enabled the LTTE to purchase the mouths of foreign parliamentarians, foreign NGOs, foreign human rights groups, foreign lawyers on retainer payroll & even members of the UN. Anyone promoting the theory of ‘both sides must take equal blame’ are welcome to counter any of the arguments made above with facts & evidence. Loyalty for the country & national army cannot be termed bias simply because I do not share the same feelings for an internationally banned terrorist movement. I see no reason to change this simply to strike a deal because deals cannot compromise the truth that LTTE killed people in cold blood under orders. Prabakaran, LTTE cadres, LTTE linked TNA, separatist elements, LTTE fronts & anyone that has benefitted by the LTTE Inc must all take blame for prematurely ending the lives of thousands of people & there is no ‘both parties must take equal blame’ theory here.